Hot on the heels of thrash's big four - Metallica, Slayer, Megadeth and Anthrax - sharing a stage together for the first time ever last month, we speak to the men behind the beats that defined a ground-breaking genre. 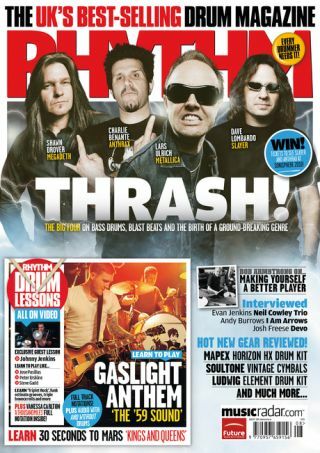 We chart the birth of thrash and get the lowdown from Lars Ulrich, Dave Lombardo, Shawn Drover (you can see his verdict on the issue below) and Charlie Benante on double bass, blast beats and much, much more. You can also win tickets to Sonisphere festival worth £630! All this and more in the August issue of Rhythm, on sale 6 July. Or you could order your copy from www.Myfavouritemagazines.co.uk.